We've been having such a great time working toward our SCCA Competition License running in the Spec Miata class races that we almost forgot that there are still plenty of cool events we can do with our daily driver. 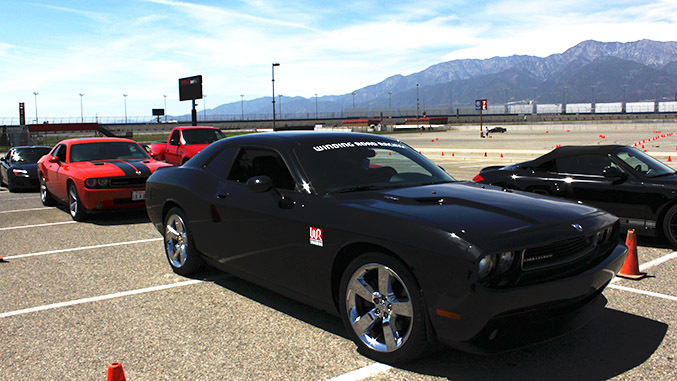 As the weather warms up, autocross events are popping up around the country, so we decided to take the WRR Challenger out to the autocross to give this fun and accessible way to get involved in road racing a shot. Autocross is time trial-style racing on a short, technical road course that's typically set up in large parking lots via road chalk and cones. Laps normally range from 30 seconds to just over a minute depending on the configuration of the course. Speeds rarely exceed 65 mph, minimizing risk to both car and driver, and instead emphasize proper driving lines, braking points, and the driver's ability to react quickly. Given the low cost to get involved and the ability to use virtually any mechanically sound street car, autocross is often the entry point for drivers looking to get involved in road racing. What kind of gear do I need in order to go autocrossing? In terms of equipment, one of the great things about autocross is that the list of required equipment is pretty short. In fact, as long as you have a Snell-certified helmet, a driver's license, a vehicle, and the registration fee for the event, you're good to go. Keep in mind that you'll be outside all day, so some other items you might consider bringing just to make the event more enjoyable include a foldout chair, sunscreen, water, and some form of portable shade. What kind of training and licensing do I need in order to go autocrossing? Prior high performance driving event experience can certainly help you acclimate to autocross quicker, but it isn't mandatory. While no formal training or licensing is required to sign up for autocross, it would be wise to familiarize yourself with the car you'll be using before heading to the track in order to understand how it behaves when driven hard. At some events, those with prior track and autocross experience are offered the option to run in all the run groups participating, allowing those individuals the opportunity to get in many more laps than they would if they were relegated to a single run group. Who organizes the events and where are they held? 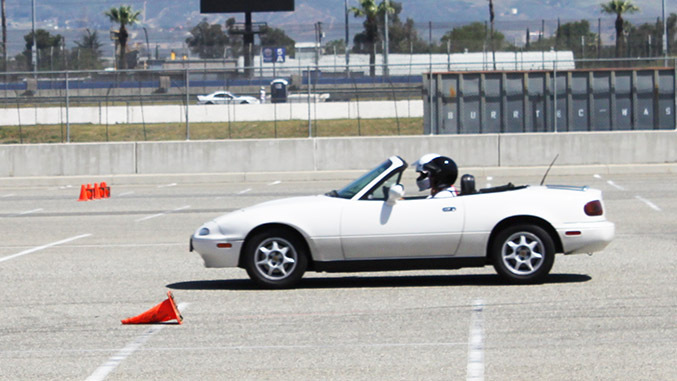 Both SCCA and NASA host autocross events. Private companies like Speed Ventures also host high performance driving events like autocross and track days within specific regions of the country. Most autocross events are held at local race tracks, while large parking lots at stadiums and even unused airstrips are also common venues. How is Autocross different from driving on a race track? Autocross courses are set up to have one car on a section of the track at a time, and are designed to be driven on by fairly stock street cars. As such, the courses are narrow, technical, and designed to test a driver's ability to handle various driving challenges in a safe environment. As we mentioned before, speeds rarely exceed 65mph at the fastest parts of the course, so chances of getting into any of kind of real trouble are fairly minimal. That said, when driving on a race course, not only do you have more tarmac to work with, you typically also have much more time to set up for corners. Autocross may be at slower speeds, but since the course is much smaller it is far less forgiving if you get the car bent out of shape. Oversteering or understeering a corner on a race track might equate to a slower exit speed and some line adjustment. But on an autocross course, the amount of time you have to setup for each maneuver is so limited that if you botch a section you typically have to get off the throttle to re-position the car correctly or you'll end up with a domino effect, messing up an entire sequence of turns until you get back on the right line. Do I need to have my car specially tuned for autocrossing? Tuning or modifying your car to improve performance on the autocross course certainly doesn't hurt, but much like prior track experience, is isn't mandated by any rules. With that said, if you choose to do them, there are some basic changes you can make that can help improve both your lap times and general enjoyment of autocrossing. 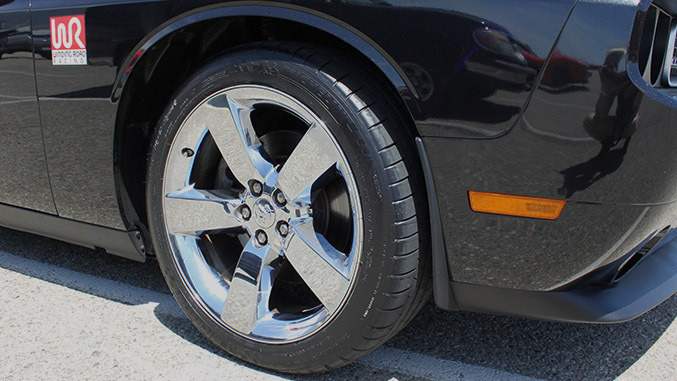 To illustrate this point, we brought the Challenger to the event on a set of well-worn all season tires - not the most ideal rubber for the given situation. During our morning runs, we quickly found the limits of grip, which made improving our lap times more difficult since we found ourselves fighting the car's desire to slide in every direction imaginable - sometimes forcing us to correct both understeer and oversteer in the same corner. The results of pushing the car well beyond the limit of the tires' grip can be seen in the second run in the video below, where understeer and an unruly recovery equated to an especially slow and messy lap. Fortunately for us, we expected this would happen, so we'd planned ahead and brought a new set of Michelin Pilot Super Sport tires with us to the track, and swapped them out during the lunch break. As you'll see in the video below, this immediately altered the car's behavior on the course, reducing its tendency to get bent out of shape in the fast corners and allowing us to get on the throttle earlier as we exited turns. The lap times reflect both our improved familiarity with the course and significant improvement in grip provided by the Michelins. Other simple things you can do to improve your lap times (as well as your car's performance in daily use) is to reduce weight by removing anything and everything in your car that you don't need, make sure your tires are properly inflated, and ensure that your brakes are in good working order. If you opt to do more extensive modification to your car for autocrossing, keep in mind that if you choose to compete in SCCA and NASA autocross competitions, certain modifications may put your car into a different class than it started in. We'll explain a bit more in the next section. How does autocross competition work? When running autocross through a sanctioning body such as SCCA Solo or NASA-X events rather than the "test and tune" style event we went to, cars are divided into classes based on specific criteria mainly based on how modified your vehicle is. This is worth keeping in mind if you plan to do extensive brake, suspension, drivetrain or bodywork to your car for autocross competition, as doing so may push your car into a different class. A full rundown of the SCCA Solo rules can be found here, and you can check out NASA's autocross rules and car classifications here. Each run is timed to 1000th of a second and penalties are assessed for violations such as knocking over cones on the course. During competition events, each competitor is typically allowed two runs, with the faster of the two runs being counted as your lap amongst the other competitors in your class. The fastest lap of the day in each class wins that class. What was the sequence of events at the autocross? We arrived at Auto Club Speedway in Fontana, California in the morning where we were instructed to head to a specific garage at the track to check in and get assigned a run group for the day. While most participants were assigned to either Group 1, 2, or 3, those with prior autocross experience could opt to run in Group 4, which meant that they could do laps during any run group's session. For those wanting to get the maximum amount of runs in, this was the ticket. 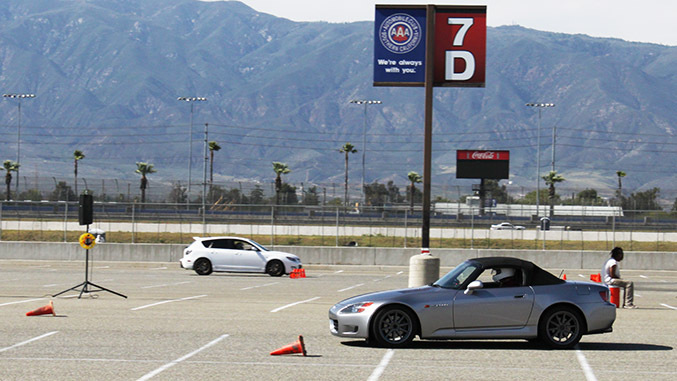 We were assigned to Group 3 and headed out to the autocross course, which was set up in one of the large parking lots in the infield of Auto Club Speedway's oval track, and parked adjacent to the course while Groups 1 and 2 ran their sessions. We also took advantage of this down time to track down our autocross instructor. For an additional fee, Speed Ventures offered seat time with an instructor who would provide some guidance on how to approach the course, as well as critiques of our own laps to help us shave some time off. Since we'd never been on this autocross course before - or any autocross course, for that matter - he offered to have us ride shotgun in his car while he took us on a fast lap around the course, pointing out both the notable sections of the track and how best to dispatch them. Afterward we geared up for our run session, and once Group 3 was called, we lined up to head out on the course. Cars are funneled into two lines, and then down to one just before the start line. Track officials send out a car once every 20 seconds or so, once adequate space between each car on course has been established. After groups 3 and 4 ran their sessions, everyone headed to lunch. We decided to use the lunch break as an opportunity to head to a tire shop to swap out the all-season rubber for our shiny new Michelins. The fantastic crew at Mountain View Tire had us in and out of the shop before lunch was over. A surprisingly diverse roster of cars at the autocross. Back at the track, the sessions ran much the way they had before lunch, with each of the four groups running laps in one-hour sessions. It had been abnormally hot all morning and a handful of participants had decided to call it a day at lunch, while a few new faces also showed up for the afternoon session as well. One of the most interesting aspects of autocross is that it offers insight about how a road car behaves at the limit that really can't be gleaned outside of a racetrack setting. Swapping tires mid day also allowed us to fully grasp just what a huge difference appropriate rubber makes in the performance equation, and how much they alter how a car can be driven near its (and our) limits. We also realized that while autocross is very different from wheel to wheel club racing on race tracks, navigating a course at 40-65 miles per hour can be pretty challenging and exciting in its own right. Recording our laps also gave us a chance to critique ourselves (and our fairly liberal interpretation of the course configuration) to see where more time can be saved and technique can be adjusted. It's also worth noting that since the "test and tune" style autocross we attended was not a competitive event, it offered us the ability to get in many more laps than we would have had we attended a sanctioned, competitive autocross event. While a day at an SCCA autocross might only afford a participant 3-5 runs total throughout the day, we logged more than a dozen runs over the course of the day, and those in Group 4 were likely able to run many more than that. Something to consider if you're interested in testing the waters before diving straight into autocross competition. They say autocross can get addictive, and now we understand why. With its combination of low cost accessibility, challenge, and the chance to really push a road car harder than we'd safety be able to on the streets in a controlled and well designed environment, we'd be lying if we weren't already thinking about our next chance to autocross. It's remarkably easy to get involved, you get tons of laps in over the course of the day, and you get to run your car with a bunch of other like minded gearheads without the potential for police intervention. What else can you really ask for?